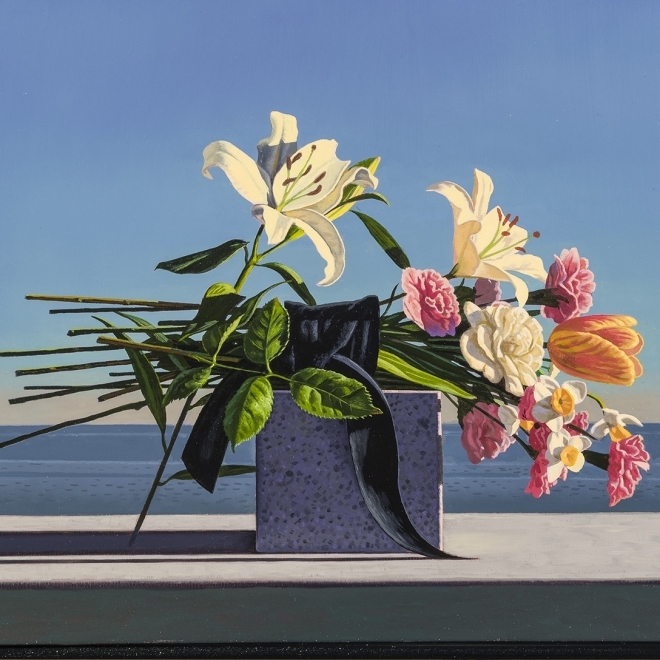 Hirschl & Adler Modern is proud to announce the opening of David Ligare: New Paintings on April 12, 2012. The artist’s first solo exhibition with the gallery will feature over 15 new paintings in oil and will be accompanied by a 16 page catalogue with illustrations in color. David Ligare has spent the last thirty years painting, studying, and thinking about what he calls “recurrent Classicism” – the tenets of Greco-Roman Classicism as they have appeared and reappeared over the centuries. The photographic intensity of his vision is decidedly modern, even as he explores the ancient ideals of measure, harmony, and rich philosophical content. In these new works, the artist focuses on the subject of aprachai and primitiae, the ancient Greek and Roman practices of giving thanks to the gods by offering them a portion of the “first-fruits” of their harvest. Ligare bathes his subjects in golden light and stages them in dramatic altar-like spaces that follow the ancient format of reverence and gratitude – gratitude for the bounty of the harvest and the sheer beauty of nature. Also included in this new body of work are powerful, large-scale seascapes. Ligare’s interest in Classical history extends beyond his subject matter and into the process by which he creates his paintings. Inspired by the teachings of Pythagoros, Polykleitos, and Plato, Ligare bases his compositions on logic and ancient systems of harmonies and mathematics. In so doing, he imposes a sense of order on the natural world, paying homage to both nature and analytical skill, creating art that quietly and subtly seduces the eye. These careful and minimal compositions further a metaphoric reading of his work, and we are invited to contemplate these ancient ideals as we experience them in the present. Born in Oak Park, Illinois in 1945, Ligare attended The Art Center College of Design in Los Angeles, California. His work can be found in such notable collections as The Museum of Modern Art, New York, The Fine Arts Museums of San Francisco, The Wadsworth Atheneum, Hartford, The Frye Art Museum, Seattle, The Uffizi, Italy, as well as numerous other public and private collections across the United States and the world. David Ligare: New Paintings opens on Thursday, April 12 and runs through Saturday, May 12, 2012. Located in the landmark Crown Building at the corner of 57th Street and Fifth Avenue, Hirschl & Adler Modern is open Tuesday through Friday, from 9:30 am to 5:15 pm, and, Saturdays from 9:30 am to 4:45 pm. For additional information or images, please contact Shelley Farmer, Director, or Dunham Townend, Associate at 212-535-8810 (phone) / 212-772-7237 (fax) or by email at ShelleyF@HirschlAndAdler.com or DunhamT@HirschlAndAdler.com. Please visit our website, www.HirschlAndAdler.com, for an online preview of the exhibition.